. Please click here for your Propsition 65 warning. Rock Hard 4x4 is very proud to offer the original and most trusted bolt-on Towing Adapter for the Jeep CJ through Wrangler TJ/LJ JK and JL . The RH4x4 Jeep bolt-on Tow Bar Kit is the simplest way to adapt your Jeep Wrangler TJ/LJ and JK/JL to your Blue Ox, RoadMaster, or Reese towing bars. 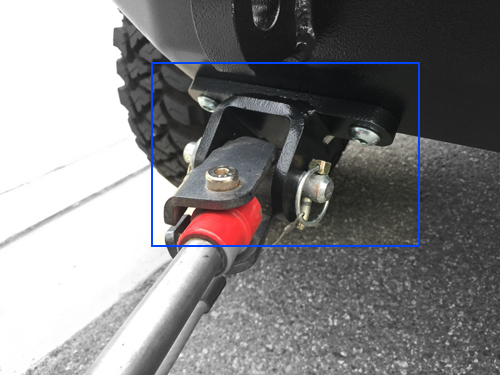 Our brackets bolt securely into place on our Rock Hard 4x4 front bumpers giving you a safe tow point you can trust. Our unique front bumper mounting system allows us to tie our Tow Bar Bracket Kits directly into your frame horns on the front of your Jeep. This is the safe, smart, and right way to tow. No other bolt-on adapter comes close to the fitment, quality, and durability of our system. Center to Center Mounting Holes: 5-1/4"
Our mounts are 100% Made in the USA and made in house giving us total control over quality and design. Each mount is laser cut and formed exactly for your Blue-Ox, RoadMaster, or Reese tow bar. Spacing for the receiving pins is computer set for precise accuracy. Each mount is made from 100% steel using weather resistant hardware and finished with a weather and rust resistant powder coat finish. Thanks in part to our computer aided laser cut design, each mount bolts right to our bumpers. This results in a headache free installation. 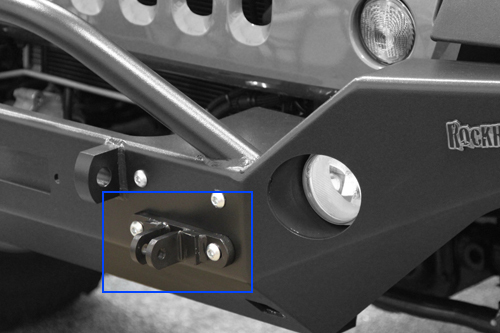 RH4x4 Tow Bar Bracket Kits require a Rock Hard 4x4 front bumper installed on your Jeep CJ, Wrangler TJ/LJ or JK and JL. For a complete list of available front bumpers, please see the FAQ list below. Do I still need a wiring harness? Our RH4x4 mounts do not include a wiring harness for lights. Do these a braking system? Our RH4x4 mounts do not include a braking system harness. What if I'm not using a Rock Hard 4x4 front bumper? You must ensure your application is strong enough, legal, and safe to tow from. Rock Hard 4x4 is not responsible for flat towing from a non Rock Hard 4x4 front bumper. No. Our brackets bolt into place for a truly bolt-on install. RH4x4 tow bar bracket kits ship powder coated black with a semi-smooth, semi-gloss finish. Where is this mount made? This product, like all RH4x4 parts, was designed, developed, tested, manufactured, and if applicable, powder coated, and shipped in the USA. And we don't mean the 75% legal standard to be able to say Made in USA. We are 100% Made in the United States of America! Coating (if applicable): Due to varying climates and individual use, we cannot offer a warranty on powdercoating. Average Customer Review: 5 of 5 Total Reviews: 16 Write a review. Brackets are well made and fit perfectly. Extremely happy with the tow bar brackets! Great quality, and the kit came with all fasteners. After a simple install, I was ready to tow my Jeep behind my RV within a hour and a half. The kit was shipped out within a day and arrived right on the scheduled date. I shopped around, and rock hard4x4 has the best price too! Good people!!! They were just what I needed. When they arrive one of the brackets was deformed and would not connect with the tow bar. One call to Rock Hard 4x4 and a short conversation with Jason and the problem was resolved. A couple of days later a new replacement bracket was delivered to my house. Installation was as described, everything fit and matched up well with Demco tow bar. Would recommend to others.